Loosen Stiff Joints. Relax Tight Muscles. Improve Flexibility. ALL LEVELS. ALL REGIONS DVD. 86 minutes. 14 exercises. This video records me (FJ) at age 75. Each day finds me quietly waging my own personal battle against aging. I can’t let a day go by without doing my own personal regime of stretches. When I don’t do my daily exercises, my body complains with pain. In this video I will show you the exercises I have found to be most helpful in keeping my arthritic hip functioning pain-free and in “unseating” those joints and muscles that become stiff and achy from prolonged sitting and inactivity. This program will benefit you the most if you would do it from start to finish. Try to make time so you can do it without interruption. These exercises are deliberately contemplative. Think about and talk to your body. It’s the only one you have. Treat it well. The CD music is by Scott Killian. Once you learn the exercises and can do them by yourself, it should take you about 45 minutes to do the entire program without stopping. If you are pressed for time, do the Morning Wake-up which takes about 20 minutes. BACKGROUND: I was interested in the “Meditative Stretching” DVD from the moment I saw it, because of the unusual combination: stretching and meditation. Yet, I was hesitant to buy it at first, because of the conflicting reviews on Amazon. Now that I have used it, however, I am glad to say that I could not have been more wrong in my hesitation: both the stretching and the meditative aspects of the DVD are right on the mark, and bringing them together renders a result that is truly more than the sum of its parts. STRETCHING: What distinguishes this DVD from other stretching DVDs I have used before is not really the single exercises by themselves, but the way they are “developed” and “assembled.” For example, the familiar “pelvic tilt” is transformed by Finis into a full-circle rotation—and, having done the regular pelvic tilt for years, I can attest that Finis’s version gets my sacrum unstuck far more effectively. Similarly, the series of “stretch your knee, hamstrings, and hip”-exercises appear to be deceptively simple; yet, the gradual progressive release that Finis worked into them not only stretches the hamstrings, but enables them to retain that stretched state better (this is something I could never get with other hamstring stretches, whether standing or lying on the floor). Still more, the seemingly small “elongate your torso and rotate your feet”- intermission after each exercise really helps to integrate the individual movements into the whole body posture and alignment. Finally, even though the DVD’s two “do-along” tracks — the complete 45 min program and 20 min morning wake-up — share the exercises, the order in which they are arranged is different, and I noticed that the complete program has a relaxing effect on me, while the morning wake-up leaves me energized. Most often I practice this DVD in the evening, after a hot shower. When I have time, I follow it up with ballet-specific leg and hip stretches, and then work out the remaining aches and pains with specific massage tools (foam roller, teracane, Franklin textured balls). This last addition merits a special notice: I learned about these tools, and the specific muscle groups that they work on, from another Finis’s DVD, “Self-Massage.” Together, these two DVDs have been a godsend to me and I strongly recommend them to others—as a matter of fact, I am going to send a copy of each to my aging mother! Purchasing workout videos is always a crap shoot for me. Many are so cheesy that they’re irritating to listen to… so I don’t end up using them. But this one was just what I was looking for. The instructor is a nice, normal guy who gives good instructions and has a calming demeanor and voice. (Love the vibrant orange sweat pants he’s rocking too! LOL) There’s one section where he explains each stretch completely allowing you to get comfortable and learn the technique, then you go through a few reps of it before moving to the next one. The stretches aren’t complicated, so the next time I did it, I did the section that eliminates the detailed instructions and just does the reps. If you sit a lot at work or have soreness in back/hips, this is great. It’s all floor work, and afterwards, I’m very relaxed (the meditative part is nice slow stretches with deep breathing) and aches and stress are gone. After only watching 3 times, I was able to repeat all the exercises on my own while watching regular TV. Even without the calming music of the video, the stretches and deep breathing still help relax you. Obviously it’s not aerobic so you won’t work up even the slightest sweat, but if you want to get some exercise and chill out, this will do the trick! Thank you so much for making the DVDs Meditative Stretching and the new one about Self-Massage. I have needed something like this for a long time and nobody out there does the comprehensive, detailed, and compassionate way of teaching this that you do! My newest addition to the Finis Jhung DVD collection is Meditative Stretching and I am simply in love with it! 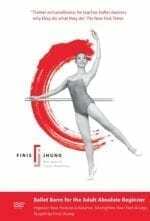 I am an adult student of ballet at Alvin Ailey Extension and take class with Finis Jhung regularly. However, I noticed that on those days when I do not go to class, my body complains about stiffness and I especially feel pain in my back. I decided to put an end to this discomfort so I purchased this DVD and have used it regularly. I noticed the difference very soon both in class and in my every day activities – my body felt more supple, and that allowed for more beautiful and stable movement- and the disappearance of pain. I first began with the Full Class Mode* so that I could learn the exercises under Finis’s directions. After having worked in this way a few times, I then went directly to the Workout Mode* where you do the exercises without the instructions. I was able to work at my own pace coordinating the breathing with the movement. At that point, I felt the full result of the exercises both on body and mind. Once again, Finis excels in presenting a sequence of gradual exercises that improve flexibility and loosen up those joints which are rustier with the passage of time and physical inactivity. 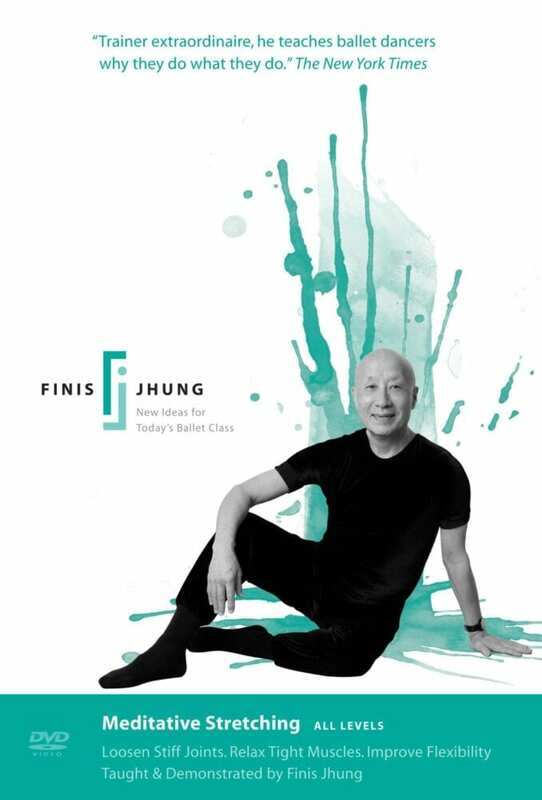 He is creative in naming his exercises in unexpected ways, as for example, “the hands of the clock.” Since Finis demonstrates each exercise, the video has extra impact. The pace is relaxed and his soft whispering voice creates a special atmosphere as if he were right there, next to the viewer. The next step for me was to wake up a bit earlier and squeeze in 20 minutes to complete the Morning Wake-up short version. As expected, my day would start in a more optimistic mind frame whenever I managed to allow myself those 20 minutes. Indeed, you feel more in tune with your body. It is great! I strongly recommend it. “Mens sana in corpore sano.” (“Happy mind and happy body.”) – as the Latin saying goes. This is another gem from Finis Jhung! I now own a few stretching DVDs by Finis Jhung and each one is unique and irreplaceable. Each one offers an experience that is refreshing for both body and mind and that offers precious benefits. The title of this DVD is perfectly chosen for the experience it gives. This truly is movement as a kind of meditation, a contemplative series of moments in which the viewer/participant is able to slow down and reconnect with her (or his) own body. In today’s hectic world, where the body too often is sedentary while the mind is overloaded, this is a crucial gift. Years ago, when I first recognized that I had to do something to counteract the effects of a desk job and of aging on my body, I sampled a stretching tape from my local library and was frustrated by two things: first, the instructor (a very young and very fit individual from a modeling rather than dance or fitness background) clearly could not grasp how *truly* inflexible many people are. Even more disappointing, although paying lip service to the idea that stretches should be held for a long time, the tape itself rattled through at breakneck speed. Why? I have no idea except perhaps to speed up the filming process and save money. In these areas, as in all others, Finis Jhung’s DVDs rise above the norm of stretching/fitness productions. First, although Mr. Jhung (at 75!) is still more flexible and fit than many people decades his junior, he clearly has the experience, the knowledge, and the empathy to understand the limitations of others. He consistently provides full, clear, thoughtful, and helpful instruction, explaining exactly what to do and what to expect, and always reminding the viewer to work within his/her present range of motion, building carefully to increase flexibility in a safe and responsible manner. Deep thought has obviously gone into every aspect of this presentation, including a superbly paced sequence of hip-loosening exercises that gently guide the viewer into gradually deepening the stretch. This is also the ONLY stretching instruction I have received (including instruction I got during “in-person” group classes) in which the stretches were actually held for the length of time that stretching experts recommend. In that long-ago VHS tape I mentioned earlier, the only option was to scramble up from a stretch in order to “pause” the tape if I wanted to hold the stretch for the length of time the instructor recommended (but didn’t practice). Mr. Jhung creates a system that is both efficient and wise by having an instruction section for each stretch in which the viewer learns how to do it properly and then a demonstration section in which the viewer can simply follow along, relaxing into the luxury of long, body-soothing stretches. No scrambling up and tape-fiddling is necessary! The DVD is set up so that viewers can choose to have an unbroken series of the demonstration sections* once they’ve fully absorbed the instruction, and on hectic days viewers can even choose a twenty-minute version of selected stretches to help them prepare for a packed day or unwind from it. I’d love to think that I will always do the full version but, to my chagrin, I suspect I will make extensive use of the “morning wake-up” version also. Finally, I just have to say the beautiful music and thoughtful, wise comments from Mr. Jhung are part of what makes this DVD an aesthetic and emotional experience as well as a physical one. This DVD leaves you feeling better in every way. At a time when almost all of us spend most of our day sitting and when stress seems the normal condition of people’s lives, this DVD is a necessity at the same time that it feels like the most pleasurable self-indulgence. I can’t say how important this DVD is for relaxing and meditating. I truly appreciate this Meditative Stretch DVD. I have practiced yoga for over 50 years and taught for 20, but this routine is truly precious. If you pay attention this becomes a meditation and unlike today’s yoga it is not just for one body type; everyone can do this and reap immediate benefit from it. This is definitely a keeper. I am recovering from knee surgery and am finding the stretches very helpful. The instructor is very deliberate and exacting. It does take a long time to get through the program. However, it is necessary to make sure you are doing things correctly. I am looking forward to the day I no longer need the reminders. Then I can use the portion without instruction. * He has an easy voice to listen to which is also helpful. Highly recommend. It has been several weeks since the above writing. When I first started the program I used to think I couldn’t finish each segment. Now I am surprised when it is time for the next stretch. Mr. Jhung says the work will improve your posture, and it does. Every day I become more flexible. I can now pivot and not suffer from knee pain. I used to wake in the morning and ice my knee and apply ointment. What a joy to get out of bed anxious to move. *Workout and Full Class modes are available only on hard-copy DVDs, not streaming videos.